Putting text into graphics has significant drawbacks for search engine optimization. Such pages transfer across the Internet much more slowly, and because the pages contain no real text, search engines don’t have anything to index. And don’t believe the “Google is magic” hype; Google does not read text in the images it finds online and is unlikely to do so for a number of years yet. For example, the text shown isn’t real text; the text is part of one large image. This example may be the perfect text to get you ranked highly for your most important keyword phrase, but because it’s a picture, it doesn’t do you any good. Many websites use images heavily. The overuse of images is often the sign of an inexperienced web designer — in particular, one who’s quite familiar with graphic design tools (perhaps a graphic artist who has accidentally encountered a web project). 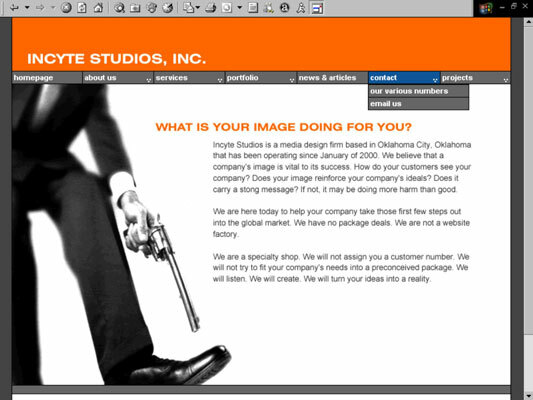 Such designers often create entire pages, including the text, in a graphical design program and then save images and insert them into the web page. The advantage of this approach is that it gives the designer much more control over the appearance of the page — and is often much faster than using HTML to lay out a few images and real text.